This weeks appearance by former U.S. president George W. Bush at an event hosted by a local evangelical Christian university has been cancelled while the mainstream U.S. Media ignores the international embarrassment.The decision came Wednesday, the same day three former students launched a petition urging the university to cancel the speech. On Tuesday, a class valedictorian and professor publicly spoke out against the appearance following the resignation of another staff member. Bush was scheduled to speak Sept. 20 to about 150 people at an invitation-only breakfast hosted by Tyndale University College and Seminary, home to about 1,400 students at two campuses in Toronto’s north end. Tyndale supporter Prem Watsa, chief executive of Fairfax Financial Holdings and sometimes referred to as “Canada’s Warren Buffett,” was sponsoring the event, which the administration said was intended to raise the university’s profile. Watsa did not respond to requests for comment. A brief on the university’s website Wednesday afternoon announced the cancellation “due to scheduling change” but provided no details, nor did it mention Bush by name. Tyndale spokeswoman Lina van der Wel confirmed the note pertained to the Bush event, which she said would not be rescheduled. She said she could not explain the “scheduling change,” nor say whether it was the university or Bush who cancelled. University president Gary Nelson held a town-hall meeting at the school at noon Wednesday, a few hours before the decision to cancel was made public. Faculty reached by the Star refused to discuss what happened at the meeting. 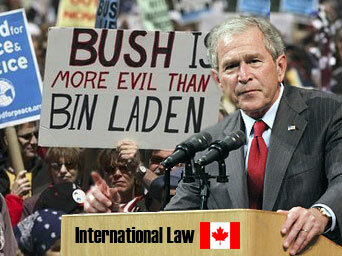 Opposition to Bush’s appearance at the non-denominational evangelical university had been growing within the school’s community since Monday after the story ”Bush to make promotional appearance in Toronto for Christian college” was published in the Star. The following day, a class valedictorian and professor spoke out passionately against the visit. The university also confirmed “a valued employee” quit in protest. 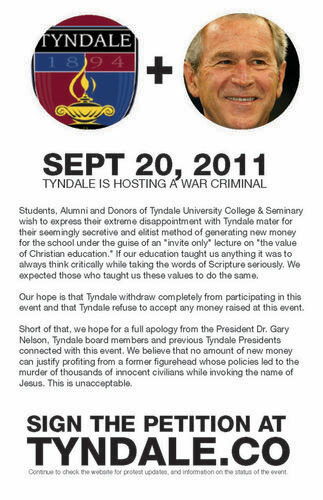 Critics accused Tyndale of sacrificing its peaceful ideals to attract wealthy donors with the exclusive event. Many students and alumni also complained they only heard about the high-profile appearance through the news. As it stands, the main stream media in the USA has be absolutely silent on the international rejection of George W. Bush. ‘US media silence serves a purpose for the establishment. This is an embarrassment, a disgrace that America does NOT want to talk about or face. The fact that we, our culture and society, are complicit in the wholesale criminal acts of this pathetic Head of the Torture Snake is something that we don’t want to talk about. So silence works best. Besides Lady Gaga is on Dancing with the Stars and that’s much more easy on the soul” says Mike Leon, editor-in-chief of Veterans News Now. In this authors view, to me, whats even worse is that our presidency has been disgraced. We’re are forever scarred by the psychotic predators who commited crimes against humanity in our name. And we, the people, are numb, nuertered, and morally bankrupt without standing. Instead, the rest of the world has taking over for us as we’ve vacated the leadership stage. The conscience vacuum has been filled by Canadians and others worldwide who’ve decide to get up and stand up and fight against what we’ve become. At best how embarrassing is that we no longer stand for justice, peace, and humanity. At worst, we’re the 800lb fascist in the room pointing fingers at the ghost of Mother Teresa, Mahatma Ghandi, and Martin Luther King. What a disgrace!